To the new aquarist understanding water chemistry can seem like a daunting task. You may have thought that all you needed to do with your fish was clean, feed and occasionally medicate them, but suddenly there are lots of unfamiliar names and processes to understand. The good news is that it's not really anything like as complicated as it seems. What's more, if you get your water chemistry right you'll have much healthier, happier fish who are easier to look after in every other way. Like all animals, fish produce waste products. These contain ammonia, which, in the closed environment of an aquarium, can build up to become toxic. Imagine living in water full of your own waste and you'll understand how stressful this is for fish as well as the risk of disease it represents. Fortunately, there are bacteria which break down ammonia. These bacteria will eventually find their way into any tank of water you leave sitting around, but in order to establish an effective colony of them in a new aquarium it's a good idea to add a bit of wet gravel from an established one - perhaps from your local fish shop or from a friend. You should give the colony at least two weeks to get established before you start adding fish, and fish should then be introduced slowly, not all at once, to give the system time to adjust. Breaking down ammonia isn't the whole of the process. These bacteria turn ammonia into nitrites, and other bacteria then turn the nitrites into nitrates. Too many nitrites in the water can be bad for your fish and can cause a build-up of toxic algae. High nitrate levels can also be problematic but you can easily deal with these by adding plants to your aquarium. 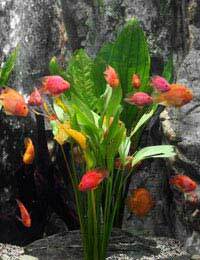 The plants will absorb the nitrates and grow, providing extra food and shelter for your fish. In doing so, they will also help to keep the pH of the water stable. pH is a measure of the acidity of your aquarium water. Different fish prefer very different levels of acidity. This is important in determining which fish you can keep together, and in providing them with an environment in which they can be healthy. Rapid changes in pH can cause shock, which can be deadly. This is something which you should be especially careful about when introducing new fish and when undertaking partial water changes. The balance of salt ions in the water in your tank is important in reducing the risk of sudden pH changes. For this reason, you should never use distilled water (which contains virtually no salts) in your tank. Tap water is a much better choice, though it should first be treated with a conditioner (available from your local fish shop, and very cheap) to remove chlorine, fluoride and heavy metals which could be toxic to your fish. Never put fish in untreated tap water - many people have anecdotes about fish who have survived this, but it's very stressful for them, like putting acid on the skin, and it can lead to long term health problems. Different types of fish prefer different levels of salinity, even in a freshwater tank, so make sure you know the needs of the individual species you choose. It can sometimes be advisable to raise salinity temporarily if your tank is suffering from certain types of parasite infestation (such as white spot), as many parasites can't tolerate salt at all. Most local fish shops stock aquarium test kits which are very simple to use. They're also easy to purchase over the internet. With a kit like this you can test your aquarium water once a week to make sure that ammonia, nitrite and nitrate levels, pH and salinity are where you want them to be, and can adjust things like filtration accordingly. Understanding water chemistry makes it much easier to keep track of what's happening in your aquarium's ecosystem. It's quite simple to do, doesn't take much time, and can vastly improve your success. Your fish will thank you for it.